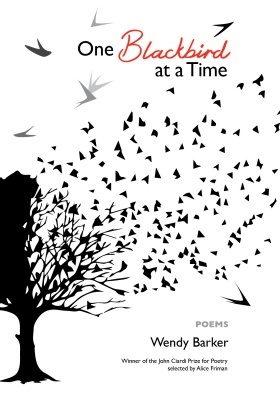 One would be hard pressed to name a book that is a better defense of the value of teaching poetry in the classroom than Wendy Barker’s One Blackbird at a Time. Each poem is not only a memorable narrative account of a significant teaching moment in the career of a master teacher of literature, it is also an addition to the rare canon of poems that teach, by example, both how to write a poem and how to live a life. That’s because every poem—from the opening “I Hate Telling People I Teach English” to the final “The Last Time I Taught Robert Frost”—is a poem of discovery, as well as one of witness. Barker goes far beyond merely expressing previously arrived-at truths—her poems are investigations into the depths of language and thought and emotion, brought together on the page in the same way that a class of students is brought together for a semester: ephemerally, yet after a time, as familiar as family, as if they have always been together and will never part. This growing intimacy between the poems and stories that inhabit Barker’s poems, and the students’ own experiences and, often sophomoric, responses to them, mediated by the scholarly and existential understanding of the poet herself, allows for complex interactions that exude authenticity. In “His Eyelashes Are Not Tarantulas,” for example, Barker relates the experience of a “star pitcher / on the university team—bare / arms so muscular I’m amazed / any straight woman around this table can utter a word” reading a poem he wrote in her poetry workshop. But if the student’s physique fulfills the teacher’s image of the ideal, his poem falls short. so we’d hanker for its tang. In the hands of a lesser poet these poems might turn out formulaic: each beginning with a reading or writing assignment; then some kind of disconnect between student and story or poem; a flashback to a story from the poet’s past or a sidestep into the student’s present; and finally a return to the original poem or story assigned, applying the insight gained. But Barker demonstrates that the deep truth of taking “one blackbird at a time,” is that one poem or story, like one life, is valuable precisely because there is none other like it. Collectively, these poems flock together around the themes of teaching, writing, and living, and yet each is allowed to dart and sweep freely where it may, so that the reader can never predict how many times a poem will light, or exactly where it will land. The power of riding the book’s singular narrative arc through all five sections in Barker’s trustworthy voice is undeniable. If I have one quibble, however, it is that I would like to have seen an interlude midway through—a series of poems, perhaps in the voices of students, responding to the lessons, or a “private” email exchange, or the teacher’s diary entries at the close of each of several days—something to expand the context in which the poems and stories were taught, and life was remembered, outside of the classroom setting, in order to augment the material in these narratives. But Barker is virtuosic with what she does in these poems, and with getting on and off the page, into and out of the book—with how to “begin a life or, I’m thinking, end” one—whether the life in question is of one line, one poem, one writer, or one student. his throat, after which her never talked again. 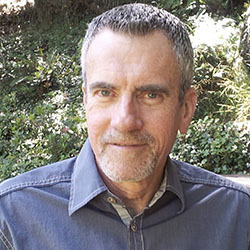 Terry Lucas is the author of two prize-winning poetry chapbooks: If They Have Ears to Hear (winner of the 2012 Copperdome Chapbook Contest from Southeast Missouri State University Press), and Altar Call (published in Diesel, the anthology of the 2013 San Gabriel Valley Literary Festival). His two full-length collections are In This Room (CW Books, 2016), and Dharma Rain, forthcoming from Saint Julian Press. Terry is the co-executive editor of Trio House Press, and a free-lance poetry consultant at www.terrylucas.com.